A wide variety of NDT services that meet demanding industrial needs. Explore non-destructive testing offering from LBNiW. We've earned a solid reputation by consistently providing superior NDT services, on time and within budgets. Experienced in large-scale industrial projects for global clients. Visit our projects to see some of the more challenging NDT programmes we have succesfully completed. Thank you for the interest in our services. I hope you find our website to be a helpful and an informative resource. As you read through, I hope you gain an appreciation for our history, accomplishments, and the strength of our NDT services offering. LBNiW is an independent NDT services company based in central Poland. The company was founded in the year 2003 and has earned a solid reputation for providing professional NDT services to a vast range of industries. We offer inspection services throughout Poland and we are looking for interesting and challenging projects abroad. We had the opportunity to deliver demanding inspection programs for large investment projects in Poland and abroad, including those located in far-off corners of the world. We are always looking for opportunities to expand into new markets. Our vision is to continue to grow, further strengthening our reputation as a quality service provider. Our NDT Services use the standard approach to code or specification compliance with industry proven non-destructive testing techniques. Again, we welcome you and appreciate your interest in our services. I hope our NDT offering will meet your expectations and look forward to working with you on your next project. 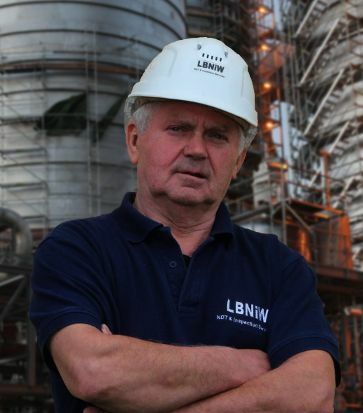 LBNiW is an independent NDT company providing a comprehensive range of non-destructive testing services for industries throughout Poland and abroad. We've earned a solid reputation as Polish, premier NDT & inspection contractor by consistently providing superior services. We have successfully managed challenging non-destructive examination programmes for large-scale industrial projects and global clients. Our highly trained inspectors have spent many years testing equipment; they know the industry and are dedicated to delivering a best-in-class service.